The catching of broilers prior to transport and slaughter is the subject of much concern from animal welfare organisations and the general public. A study by Nina Langkabel and colleagues in the August issue of Poultry Science looked at two possible ways to reduce harm to chickens during catching. 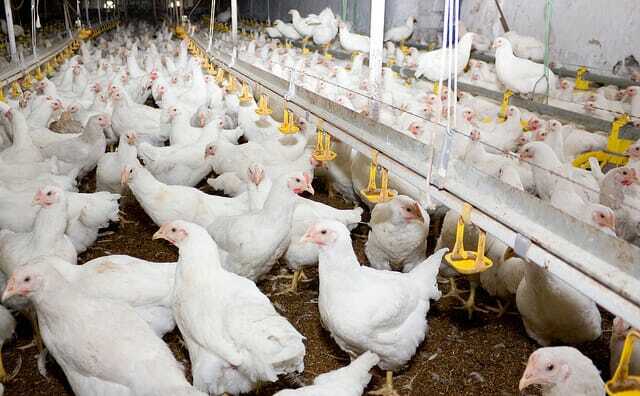 Although many steps in poultry production are mechanised, catching is not usually suitable for mechanisation due to variability in poultry houses and production methods. Therefore, catching is typically done by teams of workers, who often pick up two to three birds per hand by one leg in order to catch the birds as efficiently as possible. This situation is regarded as extremely stressful for the broilers by poultry experts. In 2012, Germany published bird catching guidelines based on Europe-wide advice, which ban catching birds by one leg. Ms Langkabel and colleagues sought in their study for evidence showing whether a two-leg catching method actually is better for the birds, pointing to a lack of previous studies in this area. In the study, they looked for body, leg, and wing lesions and compared birds caught by one leg or two legs in two different weight classes. In the two-leg catching method, no more than two birds were allowed in one hand at any one time. The one-leg method had no such limit. In both methods, the birds were carried a maximum of five metres before being placed in containers ready for transport. The lesions were detected used cameras and computer software at the abattoir, which automatically detected injuries using different colours. It also detected wing fracture using the difference between the normal wing position abnormal positions. Overall, the results showed that heavy birds were more likely to have lesions than lighter birds. Whilst body and leg lesions were fairly infrequent, wing lesions were more common. There were no significant differences between the numbers of lesions on birds caught by each of the catching methods. However, observations suggested that birds may have been more stressed during the two-leg catching method than the one-leg method. During the two-leg catching method, the animals were more restless, retreating from the activity of catching. Birds tried to escape the catching teams, crowding together in the rear of the house. In contrast, during the one-leg catching method only animals next to the catching team moved. Wing flapping, clucking and cheeps were also more frequently observed during the two-leg catching method. The researchers suggested that the increased stressfulness of the two-leg catching method may be down to the increased handling time and human interaction associated with this method. The two-leg catching method also had important implications for health and safety of workers. The catching teams reported more intensive, difficult and time-consuming working with this method, as well as more time spent bending down to catch the birds. From an animal wellbeing point of view, the authors concluded that “holding animals by both legs” is not the most important factor, and instead catchers should concentrate on treating animals cautiously. For example, the distance to the transport containers is important, as more wing flapping behaviour occurs when transporting birds over a longer distance, increasing the risk of wing lesions. The researchers suggested setting up new Standard Operating Procedures to ensure the birds' welfare is looked after during catching.